In 1894, Knud Merrild was born on the small island of Jutland in northern Denmark. At age fourteen, Merrild began working as a house painter’s apprentice in addition to his painting in his spare time. His father, a choirmaster, supported Merrild’s dream of becoming an artist by sending him in 1909 to the Art and Technical School in Stege, Denmark. When he was 18 years old, Merrild started professional art training in Copenhagen at the Arts and Crafts School, where he studied until 1917. In 1913, after viewing an exhibition of Cubist paintings at a museum in Copenhagen, Merrild turned his artistic drive toward abstract modernism and dedicated the rest of his artistic career to this pursuit. In 1916, Merrild exhibited for the first time at the annual Danish Royal Academy’s Fall Salon. The following year, Merrild entered the Royal Academy of Art. However, his outspoken views regarding modern art displeased the Academy and enticed Merrild to leave in 1918. He then founded the Avendt Kunst society which promoted a modern fusion of the fine arts and crafts. Avendt Kunst held annual exhibitions at the Kunstindustri Museum until 1922. Upon his departure from the stifling institutional environment, Merrild continued to paint and create ceramic objects with a modernist impetus. A born athlete, Merrild won the Scandinavian backstroke championship in 1919. In the years following, he traveled throughout Scandinavia and the United Kingdom using scholarships awarded to him from the Danish government. After his stipend expired, Merrild settled in London and studied art at the British Museum and the National Gallery. He funded his studies by working for these institutions as a laborer and occasional tour guide for Danish visitors. Merrild’s inability to financially support himself solely on his art works would persist for the rest of his life. I was longing to get back to my art work, and one day it struck me that a new, large and rich country like the United States, with skyscrapers and vast industries, ought to be a place where modern art would be appreciated. I remembered what the Danish critic, Georg Brandes, had said: that America would be the future art center of the world. Merrild arrived in New York City with only 25 dollars in his hand. In New York, Merrild met another Danish artist, Kai G. Gótzsche (1886-1963), and together they moved to Los Angeles in May of 1923. Upon his arrival, Merrild began developing his strong network of artist and writer friends, including Henry Miller (1881-1980), D.H. Lawrence (1885-1930), Lorser Feitelson (1898 - 1978), Irving Stone (1903-1989), and Man Ray, who authored a letter of praise to Merrild in the California Arts and Architecture journal in 1943. D. H. Lawrence invited Merrild and Gótzsche to spend the winter of 1922-23 with him and his wife, Frieda, at their isolated ranch in Taos, New Mexico. This experience resulted in the 1938 publication of Merrild’s charming book, A Poet and Two Painters: A Memoir of D. H. Lawrence, an intimate account of their stay with the eccentric author and his wife. Merrild also published a book about Henry Miller, entitled All the Animals in the Zoo (1945). Because abstract art was not widely appreciated in Los Angeles prior to the 1950’s, Merrild was unable to support himself and his wife exclusively on his career as an artist. His first jobs in Los Angeles disappointed him; Merrild worked as a set designer for a movie studio and as a designer for an architect. Producing art in his spare time, he worked as a house painter and established his own business in partnership with fellow Dane artist Enjar Hansen by the 1940’s. He sometimes painted murals for private homes, such as the estate of Walter and Louise Arensberg, who also purchased several Merrild paintings for their renowned fine art collection. After suffering a severe heart attack in Los Angeles, Merrild moved back to Copenhagen for more affordable healthcare. There he spent his final few months of his 60th year, eventually passing away in 1956. In 1922, Merrild’s artwork was exhibited for the first time in the United States at the Belmaison Gallery in New York City. Nearly ten years after the monumental 1913 Armory Show’s display of European Cubism and Futurism for the first time in the United States, Merrild’s modernist painting was embraced as an innovative, refreshing departure from conventional representational art. Throughout his career as an artist, Merrild did not conform to one stylistic genre, but instead fluidly transcended from one style to the next, often overlapping techniques to create something new. Despite his experimentation with different styles, a constant inspiration for Merrild was his desire to translate the idea of flux -constant change- into pictorial painting. This pursuit, first realized by Merrild in 1909, became a life-long obsession and finally materialized to his satisfaction in 1942, when he invented flux painting. Merrild’s earliest works from the 1920’s resemble a breed of Cubism influenced by the severe lines of Art Deco. 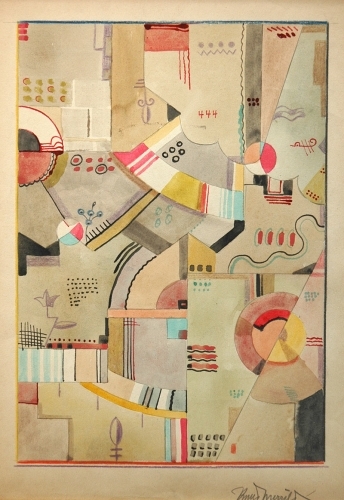 By the late 1920’s and into the early 1930’s, Merrild produced drawings and paintings in the geometric vein, such as his watercolor on paper Composition of 4’s (c. 1935). In form, the overlapping planes created through repetition of lines and basic shapes in Composition of 4’s are reminiscent of Wassily Kandinsky’s (1866 -1944) early geometric, abstract oil paintings in the Bauhaus. It also recalls an earlier, Cubist painting by Merrild, To Love is to Suffer (c. 1922) which uses the same half-colored leaves and flowers as seen in Composition of 4’s for the print design on the woman’s blouse. These distinct leaves appear again as the focal point in Four Leaves (1934). The repetition of half-colored forms in his artwork reflects Merrild’s interest in the Taoist symbols of Yin and Yang. Around 1930, Merrild gained maturity as an artist and began creating assemblages and collages, combining abstracted forms of painted metal and wood. Reflecting a Cubist heritage with angular shapes and bold colors, these Constructivist experiments utilize carved surfaces and attached fixtures, resembling the work of Dadaists Jean Arp (1886-1966) and Kurt Schwitters (1887-1948). 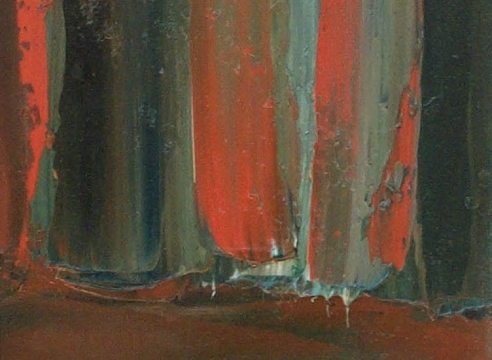 Referring to this phase of wood constructions, Merrild said, In regarding space as a medium, I surround it by restricted areas of varied proportions; penetrate it at different angles and depths with shapes and planes, creating movement and rhythm, and in addition use various materials and colors in a related harmony to the whole. One of Merrild’s most famous assemblages, Aesthetic Function in Space (1928-1933), combines multiple materials in rich colors such as brown, mustard, and deep green. The central, asymmetrical division of this composition of light and dark, big and small, and foreground and background evoke the persistent Yin and Yang motif in his artwork. Like Aesthetic Function in Space, Primaries (1938) is an assemblage of mixed cut-outs of wood painted in variations of the primary colors, red, blue, and yellow. Merrild’s minimalist relief constructions such as Veritas (1933) and Relief Construction (1933) resemble reliefs produced by Bauhaus master Joost Schmidt (1893-1948). Merrild invented flux painting in 1942, when he put himself hard to the task. Merrild’s motivation for his progressive flux technique lies in his interest in metaphysics and the ancient writings of Lao Tse and Heraclitus, who wrote that change is the fundamental law of reality. According to his 1952 Statement on Flux Painting, Merrild writes, Everything seems to depend on the whim or law of chance, accidental judgment by accidental authority and forced cause... To reflect this I attempt a personal intuitive expression where ‘laws’ of aesthetic evaluation become meaningless. Therefore, I do not subscribe to any former concepts... Merrild’s flux experimentations demonstrate his concerted interest in the fluidity of organic, unintentional forms such as the patterns of tree bark or the wrinkles of an elephant’s skin. pouring paint onto a moistened canvas while manipulating the motion of the canvas to create different shapes. Even though Merrild’s invention of flux predates Pollock’s first drip paintings by five years, Pollock is attributed to the development of this technique, perhaps as result of the minute possibilities for publicity in Los Angeles compared to New York. For Merrild, flux paintings existed as a final culmination of his desire to illuminate the subconscious through randomness and anti-esthetic values. After he invented flux painting in 1942, Merrild’s paintings achieved great national recognition with an increased number of exhibitions outside of California. During his lifetime, abstract art was not hugely popular in Los Angeles possibly because of its inaccessibility to the public as an over-intellectualized artistic endeavor. However, in 2005, as a public indicator of his brilliance as an artist, Merrild’s work was displayed alongside work of the great abstract surrealists such as Marcel Duchamp (1887-1968), Mark Rothko (1903-1970), and Arshile Gorky (1904-1948) in the Surrealism USA exhibition at the National Academy Museum in New York City. 1. Dailey, Victoria, et al. LA’s Early Moderns: Art, Architecture, Photography. Los Angeles: Balcony Press, 2003. 2. Dailey, Victoria. Knud Merrild: Works from the 1930’s + 1940’s. Los Angeles: Steve Turner Gallery, 1991. 3. Fiedler, Jeannine, ed. Bauhaus. Cologne: Könemann, 2000. 4. Karlstrom, Paul J. Turning the Tide: Early Los Angeles Modernists 1920-1956 Santa Barbara Museum of Art, 1990. 5. Knud Merrild: 1894-1954. Los Angeles County Museum of Art. Exhibition Catalog. Los Angeles: Anderson, Ritchie & Simon, 1965. 6. Levin, Gail. Themes and Improvisation: Kandinsky and the American Avant-Garde, 1912-1950. Dayton Art Institute, 1992. 1992 The Phillips Collection, Washington, D.C.
1977 National Collection of Fine Arts, Smithsonian Institution, Washington, D.C.
1942 American Federation of Arts, Washington, D.C.